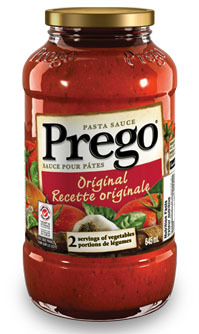 You’ll taste the bold flavor that comes from vine-ripened tomatoes in Prego Original Pasta Sauce. It’s the perfect pasta sauce whether you use it as a flavorful base for your favorite recipes or a stand-alone sauce for a delicious pasta dinner. Heat sauce in a sauce pan on medium-medium low. Heat until hot, stirring frequently.